With Election Day coming up, it seems like the 2016 presidential campaigns are now getting into full swing. 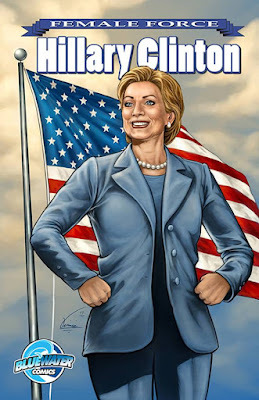 Keeping pace with the run for the White House, StormFront Publishing (previously known as Bluewater Comics) is ramping up its series of political biography comic books featuring many of the contenders, movers, and shakers that will shape the decision for the next commander-in-chief. 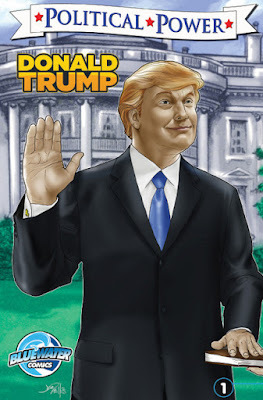 Following the successful release of the updated Hillary Clinton and Donald Trump bios, this time round we're going to release “Political Power: Jeb Bush-Legacy”. Several titles are already on shelves including biographies on Rand Paul, Chris Christie, Joe Biden, and the Tea Party Movement. Later this fall, biographies on Bernie Sanders, Marco Rubio, Rick Perry, and Ted Cruz are scheduled. As the presidential race matures and changes, other titles will follow. Also on the schedule for release this fall is the retrospective 96-page “Female Force: Hillary Clinton: the Graphic Novel”, and the 48-page one shot “Political Power: Rand Paul and Ron Paul: Don't Tread on Me”. According to StormFront Publishing, “Political Power: Jeb Bush ” is described: For the Bush family, legacy is a powerful word, hinting of destiny made manifest and the promises of generations kept. Prescott Bush, a Senator from Connecticut, felt its power, as did his son, George Herbert Walker Bush, the 41st President of the United States, and grandson, George W. Bush, the nation's 43rd President. But will the weight of legacy be too much for W's brother, John Ellis "Jeb" Bush? Can he forge his own legacy? It was written by longtime StormFront contributor and Missouri State University professor. Michael Frizell. It also features the art of Joe Paradise. Frizell said, “Though trying to distance himself from his brother and his father, it's clear that Jeb has been shaped by his past. He has some hurdles to overcome, to be sure, but I found him interesting and thoughtful. Exploring the dynamics regarding the Bush legacy afforded me the opportunity to research different eras and varied viewpoints”. The cover of the biography features Jeb literally trying to hold up the family name without succumbing to its weight. Artist Joe Paradise commented, “The thing that kept coming back to me was the pressure of taking the spotlight in the dominant dynasty in American politics. So, we're not just talking family pressure -- we're talking about something beyond comprehension for most everyday people”. “The goal here is not to proselytize for one party, one candidate, or one point of view. 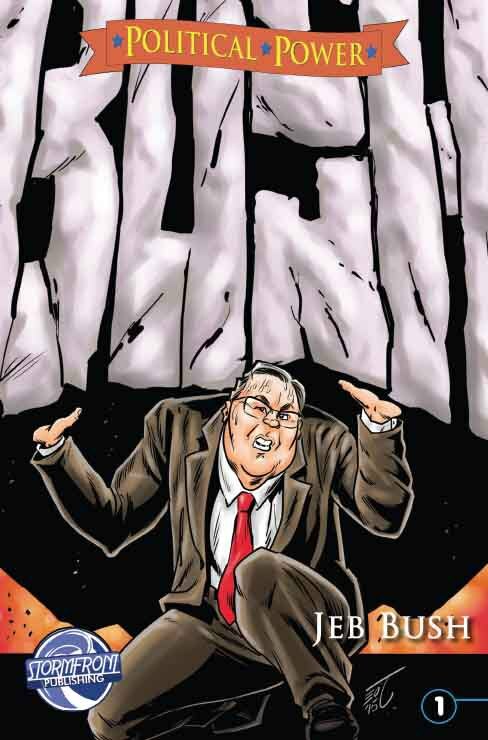 If we are to be successful, we need to balance our stories and provide an even-handed look at our leaders and the process by which they govern…warts and all”, Davis said, “These books are a good example of how a comic book can be entertaining and educational”. Davis notes that many of these titles are used by libraries and schools as a subject matter primer and support media. StormFront Comics biography comic book series has been featured on CNN, The Today Show, Fox News and in People Magazine, USA Today, The New York Times as well as 1000's of other places.